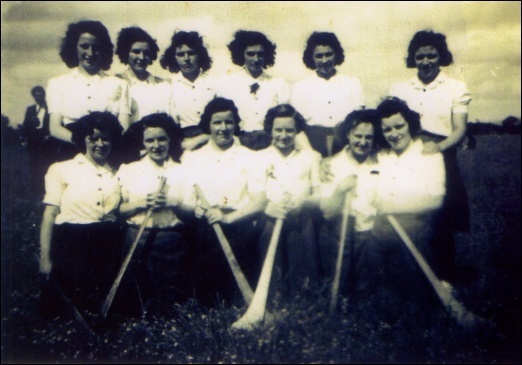 The first camogie team was formed in Garryhill about 1933 called Garryhill Rovers. The uniform was green gymslip and white blouses with gold trim. This was later changed to navy, white/cream and green. Practices took place in a field called the ‘Millmore’ so called because there was an old mill in the area and the local lads practiced football and hurling in the same field as did the Booldurragh Tug-o-war team. The uniforms were made at Vigors now Mary Tobin’s. Members of the Garryhill Rovers team in 1933 were: Four Fenlons from Carrig – Bridie, Anna-mai, Maggie and Josie; Kathleen Quirke, Minnie Quirke, Lil Quirke, Babs Kelly (Ballinree), Kittie Kelly Drumphea (later Mrs. Pat Mullins), Myrtle Vigors, Helen Vigors, Josie Keating, (Mrs. Doyle Ballinree), Bridie Whelan (B.Nolan), Maureen Whelan (Ballymartin), Alice Cullen, Kathleen Fenelon (K. Fitzgerald), Lil Fitzgerald, Nan Vaughan (N. O’Neill), Kathleen Maher, Kathy Ryder, Josie Lalor, Goresbridge. Their manager at one time was Jack Hogan Drumphea who died in 1956. Others who managed the team from one time to another were Tommy Kelly (Mrs. Johnny Treacy’s father), Terence Fenelon Carrig and Gerry Cosgrave who lived where Tom Donoghue lives now. A great story is told about Alice Cullen who played with the Garryhill Rovers team, it seems that in 1934 the team had to travel to Carlow to play in a seven-a-side tournament and Alice missed her lift but undeterred she ran all the way to Carlow and played a great game. The team won the tournament and were presented with a set of silver cups some of which are reputedly still around today. Camogie was their only social get-together, players travelled to most matches on bicycles. Minnie Quirke recalled a match against Kildavin where she got a special award for soloing up the field and scoring a point from the full-back line where she played. There was no County Board, the games were friendlies, just tournaments and were played for enjoyment only. The club declined after Josie Fenelon Carrig who was only 19 years old at the time got T.B. and died. Many feared that playing camogie had something to do with her illness and gave up playing for a number of years.